Marybeth and Evan: "He Was That Missing Puzzle Piece"
There’s a running theme we keep hearing from the couples that CMB has brought together. When we ask this question to the many engaged and married couples who have met on CMB, they all tell us some variation of the same thing: “It just felt different,” “I could just tell,” “It felt like we’d known each other for years.” Evan and Marybeth were no exception! Evan and Marybeth both say they joined Coffee Meets Bagel because they were intrigued. 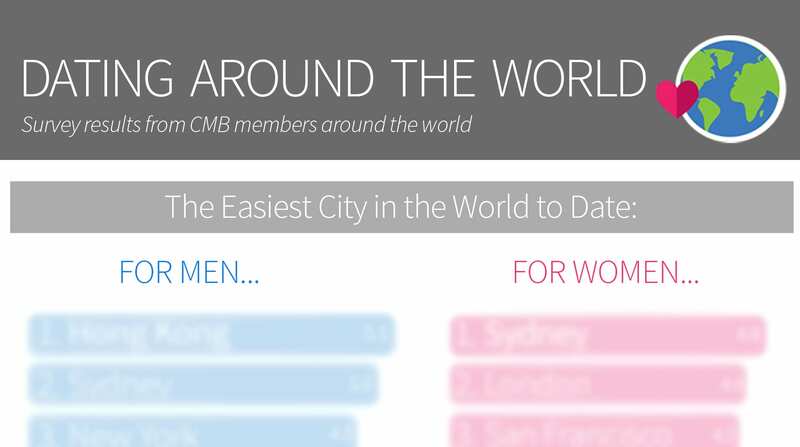 At the time, the app was fairly new and they liked the unique nuances of CMB that differentiate our concept from those of other dating apps. Marybeth was newer to the online dating scene than Evan, but they were both looking for something more serious — a real connection. From her profile, Evan thought Marybeth looked like “great girlfriend material…friendly, kind, and down to earth.” He also liked that she had the confidence to acknowledge her resemblance to Jenna Fischer (“Pam” from The Office) on her profile. Marybeth thought Evan was attractive right off the bat as well. She enjoyed his light-heartedness and sense of humor. 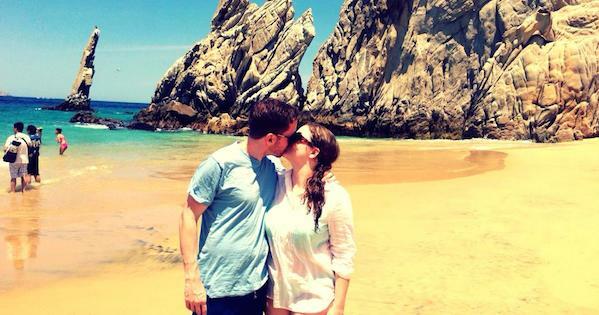 When we asked them about their first date, their responses made us laugh. Evan said “I made a plan to meet her for a drink,” while Marybeth told us that she was actually the one who initiated the first date. She continued by explaining that, while she was the one to actually suggest meeting up, he then took charge and chose the place and time. They met for a drink after work on a Monday night and Evan says he chose a bar he already knew so there “wouldn’t be any surprises.” Marybeth was happy to find that he is a man who comes prepared. They had great conversation and made each other laugh, Marybeth says she felt comfortable around him right from the get-go — always a good sign! Couples always tell us about the moment they realized that this relationship was different. Evan was facing some personal difficulties over the first year that Marybeth and him were together; he says that her “unwavering love and support” were what made him realize that she was the one. Marybeth told us she would never have even considered not sticking by Evan’s side. She was blown away by his kindness and astounded by how much he loved and cared for his family and friends. “It only made me love him more,” she told us. 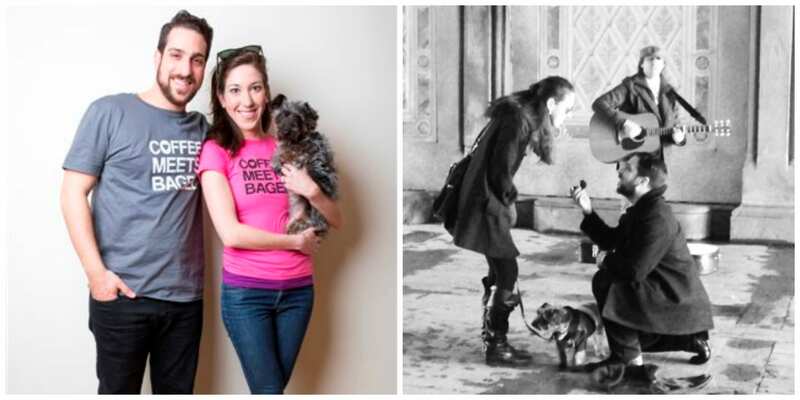 Evan is really proud of how well he was able to surprise Marybeth with his proposal. As he did for their first date, Evan planned the evening meticulously. He even told us that he actively researched the best places in New York City to propose and he finally decided on the famous 21 Club in Manhattan. He was a bit disappointed by how crowded it was when they first showed up, but fate works in mysterious ways and, much to Evan’s relief, the maitre de helped him reserve a private room for after dinner. Much to Marybeth’s surprise, when Evan took her downstairs to the restaurant’s wine cellar, under the guise of a “tour,” he led her into a small room where two glasses of champagne were waiting for them. “Only when I pulled out the little black box did she realize what my intentions were” he told us. “I was completely taken aback!” she told us. 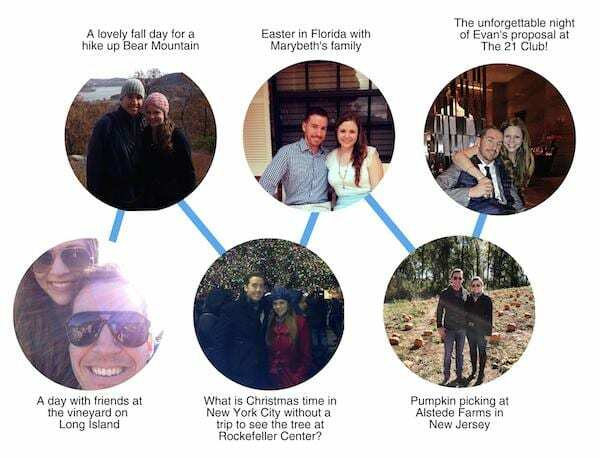 “I never did online dating– it was right for some people, but not for me.” says Phoebe. She describes a preconceived notion that online dating was for those who might be too timid to meet people in real life. Yet, despite her reservations, she signed up for Coffee Meets Bagel in solidarity with a friend. Just a few weeks into her membership, she found Logan. “I like’d Logan because of his pictures, but not for the reasons you might think.” Phoebe recalls. 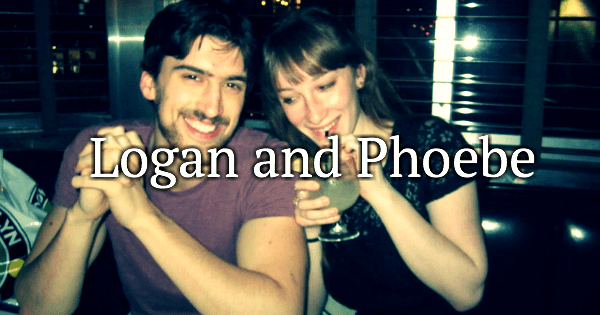 “His last picture…was him in some sort of homemade costume, clearly referencing something pop-culture-y…it told me that he didn’t take himself too seriously.” The part that caught Logan’s eye was, “where I said that I appreciate when my date ‘texts with complete sentences and punctuation,’” Phoebe says. These quirky details may have sparked in them similar longings for uniqueness and light-heartedness. Exactly twenty-four minutes after their mutual like, they became involved in a virtual tête a tête Phoebe describes as witty and intelligent. On their first date, she recalls an anxious stream of thoughts as she waited outside Hungarian Pastry Shop. To the outsider, it sounds like butterflies. Her first time meeting an individual she had met online turned into the buds of a relationship. “A few hours [after the date] something sunk in and I had that deep, uncomfortable, hot, happy feeling of possibility.” Phoebe says. Despite previous experiences where she had been “deeply hurt” and “…cast aside by a series of ‘good guys’” they became official about a month after their first date. Her advice to Coffee Meets Bagel members looking for love is to “be straightforward,” and to most importantly “release your expectations of how things should happen.” She didn’t expect to have to, but when she signed up for Coffee Meets Bagel, she took her own advice. “Open yourself up to the romance of the everyday stuff.” Phoebe aptly says. She did, and she found her Bagel. The Singles Project is a brand-new series by Bravo that is based around New Yorkers: their careers, social circles and of course, DATING LIVES. 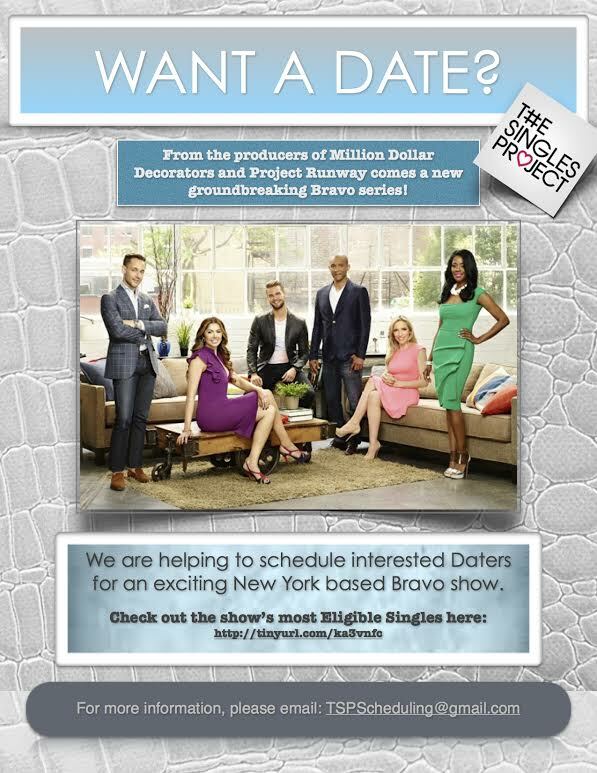 It is a lifestyle show which highlights dating in New York City. 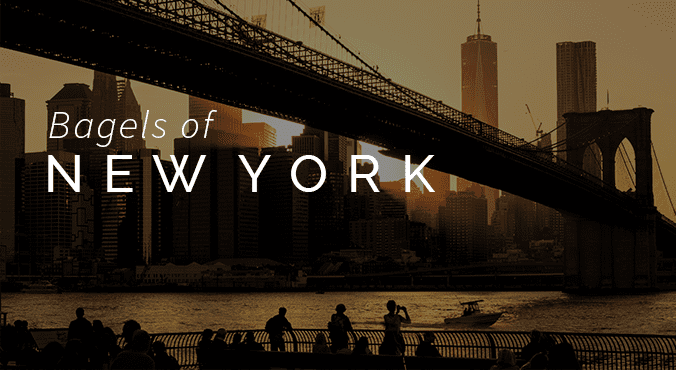 There are no rose ceremonies, no matchmaker advice, nothing contrived – just two single New Yorkers having a good time in the Big Apple City. Bravo has directly approached Coffee Meets Bagel wanting to recruit CMBers to be on the show! If casted, you will go on a date (or more) with one of the main characters on the show…as the whole world watches how you two hit it off – are you ready for it? Bagels with all backgrounds & sexual orientations are welcome! So who wants to be the next reality TV show star? 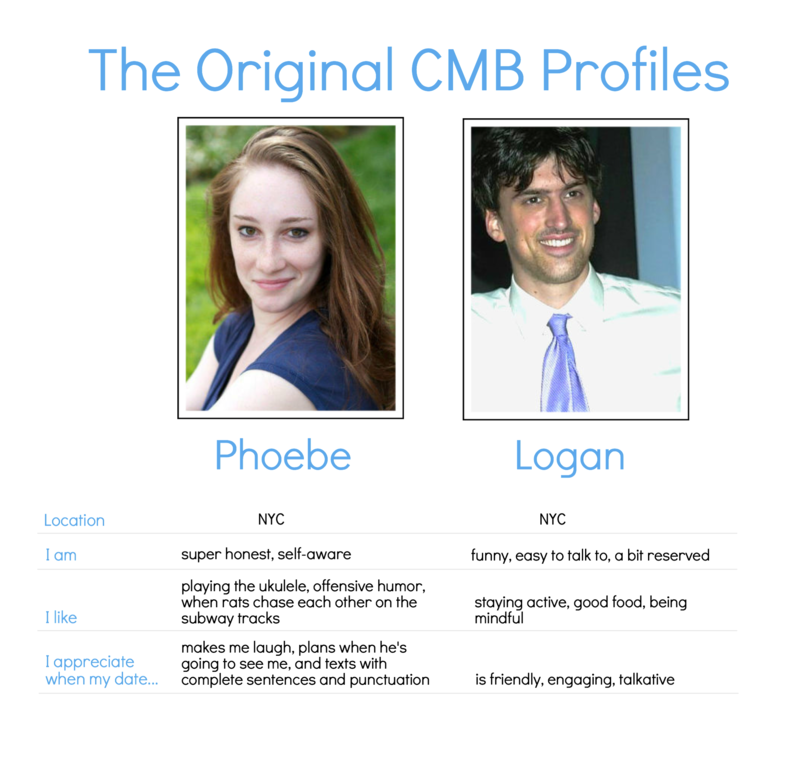 Caleigh, a health care integrator from NYC, initially decided to try Coffee Meets Bagel, a new dating app, just to prove to one of her girlfriends that she would practice what she preached. After going on a date with one other guy, Caleigh found Joe. Before she clicked “Like” on Joe’s Coffee Meets Bagel profile, she determined that she would only start a new relationship if it was bound to be better than her past relationships. Her first impression of Joe when he came up as her Bagel that day? “He carried an air about him where I thought-hmmmm there is potential”. Although it took him longer than expected to ask her out on a date, that potential was enough to keep Caleigh interested. The two met one Friday night, a few weeks after the initial text, and hopped around from one spot to another, staying up til the early hours of the morning talking, laughing and dancing. It sounds cliché, but Caleigh knew that it was “click” at first sight. She knew after one date that Joe was the one. We’re jealous over here, too. Flash forward a few months and the wedding is set! Caleigh and her “hubs” Joe will be tying the knot on August 17, 2014. We love that advice, Caleigh! And we are so happy that you two found each other.